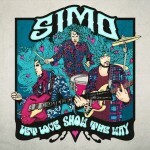 Share the post "Album review: SIMO – Let Love Show The Way"
Sometimes a new band needs a relevant context to make a splash. Happily for Simo, they seems to be in the right place at the right time to explode on to the contemporary blues-rock scene with a bang. ‘Let Love Show The Way’ cleverly plunders the past to reshape the future. There’s undoubted Allman Brothers, Hendrix, Grateful Dead, Mountain, Ten Years After, Zeppelin and Cream influences and in quieter moments even Peter Green, but such is the band’s unfettered approach that it constantly offers them new musical possibilities which they explore imaginatively. The power trio proudly stands outside the musical restrictions of its native Nashville and though they take their name from their stellar guitarist JD Simo, the band is the organic sum of it’s parts. Simo is a full on collision between the present and past. They rock hard, take jamming to the outer limits and offer no compromises, right down to the period instruments which gives them a real authentic retro sound. The trick is to make it all sound relevant to the here and now, and they do that by sculpting new exciting sounds as part of deeply entrenched grooves and a dense wall of sound. As they say themselves, they: ‘live and die by the take’, and it’s that risqué approach that gives this album its edge. The original album was scrapped and re-recorded at The Big House in Macon, Georgia. Owned by the Allman Brothers, it gave the session a real vibe, which brings us back to the point of the right time and right place. The result is a classic power trio album that stretches the artistic template from soul, blues and funk to jam band psychedelia. The band lever us into their breathless style with a beautiful fade-in to Elmore James’s ‘Stranger Blues’, which they reinvigorate with a new energy and a fresh approach. Curiously, having done so, they then sound unashamedly like The Allman Brothers on the massive groove of ’Two Timin’ Woman’, notable for JD’s slide which evokes the late Duane Allman. They slip into a riff driven, dirgy groove of ‘Can’t Say Her Name’ and add a jagged, buzz guitar and a staccato rhythm on the heavy duty ‘I Lied’, which has a restless psychedelic feel. It sounds like something the late Arthur Lee might have cooked up in an after hours session. Simo shift tempos and explore starkly contrasting guitar parts to create a layered sound. It’s all fused together by the pile driving rhythm section of bassist Elad Shapiro, drummer Adam Abrashoff and JD’s imaginative guitar parts. They almost hit a peak on the gargantuan ‘I’d Rather Die In Vain’, on which they stretch out as all good improv bands do. They ease back little and groove before JD adds squalls of notes and snaking guitar line over Adam Abrashoff exuberant cymbal splashes. All the salient elements explode into life on the psychedelic ‘Long May You Sail’, a Celtic tinged, acid rock drone with an uplifting vocal that gives the song its presence. JD drains every last drop of tonal possibility from his guitar in an extraordinary bagpipe style drone. There’s an emotive tremor to his vocal on ‘I’ll Always Be Around’, while ‘Becky’s Last Occupation’ is a more concise, riff driven piece that owes much to Zeppelin, before becoming subsumed in a psychedelic avalanche. The stop-start title track is more restrained and evolves into a fractured waltz full of shimmering, wah-wah guitar lines. Simo take no prisoners. You either buy into the integrity and spontaneity of their music – from the opulent guitar shapes to the free-form rhythm section and passionate vocals – or the depth of their craft will simply pass you by. Immerse yourself and all is revealed, as evidenced by the extended ‘Ain’t Doin’ Nothin’. Perhaps only a band with true jam band sensibilities could enter the studio with such a loose approach to produce music as thick molasses, but with spiky, gnawing solos that bite like a vampire. This entry was posted in ALBUM REVIEWS, ALBUM REVIEWS (Mobile), All Posts and tagged Adam Abrashoff, album, Allman Brothers, blues, Cream, Elad Shapiro, Grateful Dead, guitar, JD Simo, Jimi Hendrix, Led Zeppelin, Mountain, Peter Green, psychedelia, review, Simo, soul, Ten Years After, Zeppelin. Bookmark the permalink.